For some time I’d heard that FloDesign, now called Ogin, had installed their prototype Diffuser Augmented Turbine (DAWT) somewhere in the Antelope Valley. My colleague in Germany sent me a pdf of the machine standing. So I knew it existed. It wasn’t until our local native plant society was on a tour of the nearby Tejon Ranch Conservancy, that I had a location: 300th St. West. The tour was told that it was an experimental “bird friendly” wind turbine. That was the tip off to me that it was the much hyped FloDesign-Ogin prototype. Update: 2 August 2015. Ogin, when presented with this article by one of their investors responded that it presents nothing new. They argued that the design shown here has been pictured on their web site for several years. Indeed that's true. However, these are photos of a real machine seen by an independent observer and not an artists sketch or a photoshopped image. And as noted these confirm that Ogin has abandoned the key characteristic that made their DAWT different from previous DAWTs. This is noted in the companion article which specifically mentions the images from the new design on Ogin's web site. These photos confirm that the original design has been abandoned. Also, observers in Boston note that the original prototype still stands on Deer Island even though Ogin has now shifted to a new design in a new location. They have not removed the prototype. All operators have a moral--and often legal--obligation to remove wind turbines--of any kind--that are no longer "used and useful." This does not bode well for the turbine or turbines in California. This machine has been under development since 2008, so I was in no hurry to go out there and look for it. This time of year it’s hot on the desert, very hot. It could wait. 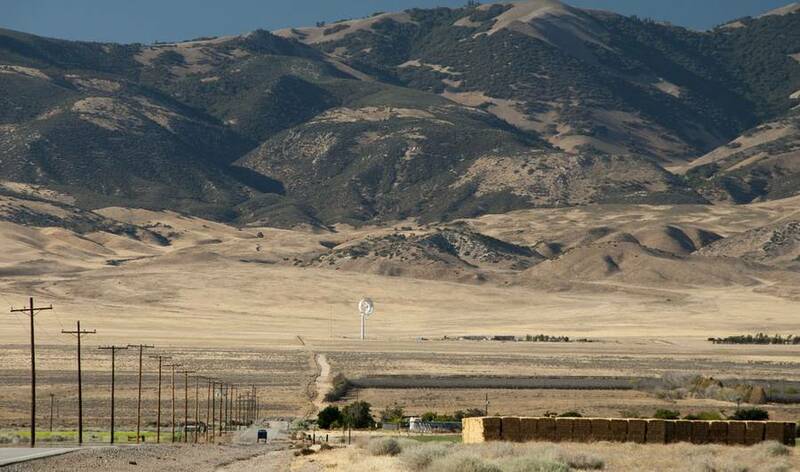 I was down in Los Angeles visiting friends and on the way back to Bakersfield I thought I’d go windmill hunting. It was balmy, in the mid-80s (28 C), late afternoon—perfect for hunting. I needn’t had worried. It was easy to spot. Despite all the fluff around the turbine, it was prominent on the landscape. So I just drove towards it until I reached a locked gate. The rotor inside the duct was spinning, but I was too far away to tell if it was in fact operating. The rotor could have been simply freewheeling. In this part of the world, landowners shoot first and ask questions later so I don’t trespass. What the photos clearly show is that the prototype has abandoned the lobed mixer-ejector feature that was the hallmark of the design—and the justification for the hype that this turbine would be the second coming that we’ve all waited for. There are even better photos on Google Maps and a close-up photo taken sometime this past spring (poppies are in bloom in the background. The photographer was either part of the installation team, had access to the site, or had a much bigger lens than I carry. They also fell for the hype around this design and labeled the photos “bird friendly wind turbine”. The photos here and those on Google are identical to those on Ogin’s web site. 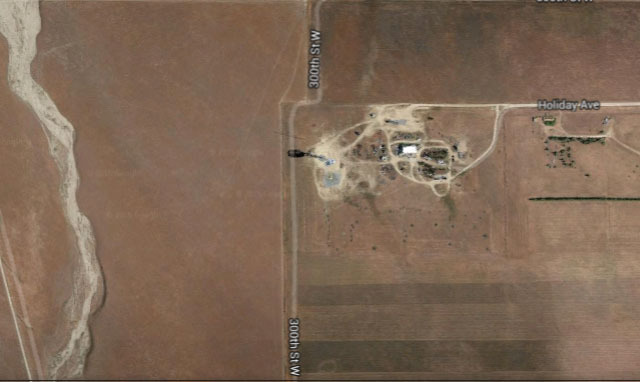 There was also an anemometer mast to the west of the turbine and ranch buildings to the east. To my knowledge this is only the second prototype. The first was installed on Deer Island in Boston Harbor some time ago. That turbine has not been removed and remains standing. Compare the photo of the Deer Island turbine in FloDesign-Ogin Some Brief Comments to those here. 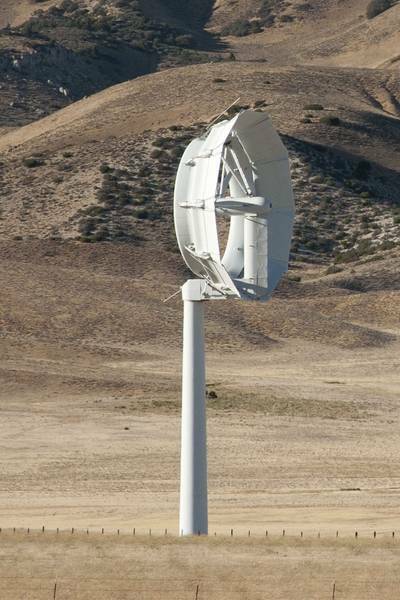 The prototype in the Antelope Valley is quite different and looks like many other ducted wind turbines that have been built before--all of which have failed commercially. Disregarding the hype about being bird friendly, I am not sure what advantages the FloDesign-Ogin turbine now offers. There’s no evidence that the design is “bird friendly”. This is simply an unsubstantiated claim. 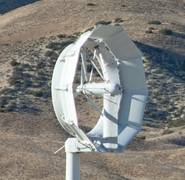 The marketers behind FloDesign-Ogin are preying upon the public’s ignorance of how and why birds collide with wind turbines. That the machine has a shroud doesn’t protect birds. It’s just something more for them to collide with.